Various iPhone users (owners of the iPhone 5s, or older models) are reporting that Apple is pushing out full screen pop-up ads inside the App Store app, recommending them to upgrade to the "ridiculously powerful" iPhone 6s - see the image on the right. According to reports from Reddit and Twitter, users aren't particularly happy about these ads, especially since they can show up whenever some random app needs to be updated. As far as we know, this is the first time when Apple is using ads like this inside the App Store app. Most likely, the pop-up ads were enabled following this week's release of iOS 9.2, which fixed bugs, added new features, and enhanced overall performance on all compatible iPhone models (from the new iPhone 6s line, to the iPhone 5s, iPhone 5, and the quite old iPhone 4s). Of course, it's Apple's right to advertise its latest products inside its own apps, though maybe this is a little bit too much? Have you seen pop-up ads inside the App Store app on your iPhone? If yes, what do you think about them? Apple on the angler to see whether the fishes would take the bait.. Steve Jobs would never have approved of such things. The apple today is doing just the opposite of what Steve Jobs stood for and worked hard for. Steve Jobs wouldn't care too much about the marketing, but it does seem a bit desperate from Apple. Sales must not be up to expectations so they probably have to start pushing their snake oil harder now. Well, they are expecting bigger and bigger sales each year or so it seems, wanting people to get the next 'best' product each year, yet people are slowly beginning to realize, that the. iPhone 6s is 2x as fast as iPhone 6! really means very little, ever since what, two-three years ago, phones from that time, sgs3 and the other phones in its class are still doing fine, and working with everything that is out, the only thing that they can't do is perhaps some of the more demanding phone games, but unless you game a lot on your phone, that isn't really going to be a problem, when they can watch videos do all the social stuff, take pictures and whatnot that are just as good as when they were new and if that's fine for you still, why upgrade? Man you deserve some cookie, true that's some flagship from 2 years ago were good enough and aside from benchmarking score, real life performance are indistinguishable except for demanding games. How do you know Jobs wouldn't have done this? Maybe the Jobs you "think" we all know wouldn't have, but that doesn't mean it wouldn't have changed. The Steve Jobs I know would have done it at some point if he needed too. Wasn't iADs developed while Jobs was at Apple? Wasn't that like 2010/11? How about no? Customer are happy with their current iphone 4/5/5s or they don't need or can't afford the newer iphone 6s. Sort clever and sublime but very lame as well. You assume they can't afford a newer iPhone? Why is it you can't ever consider that, maybe people don't want the newer models? Not wanting the newer model dosn't mean you're happy with the one you have. maybe the new model just isn't beneficial for you. I have an iPhone 4 still. Its not activated but I use it as my iPod/gaming. The new device is bigger, but overall offers no benefit for me to buy. The main reason I didnt move up to newer models is because the new iPhone's since the 5 don't support iPod Out. That change pissed me off, because at the time one of the requirements I wanted for my new car I was shopping at the time, was I wanted the iPod Out support. As soon as I bought the car, next year the iPhone 5 came out and the support was dropped. So I am way more pissed than people who bought some cheap $300 accessory that supported the feature. I bought a $30,000 truck with a fancier stereo that supported the feature and it was one of the top 5 features of must-have on my list. Because changing the port, didn't mean they had to drop this feature at all. That left a very bad taste in my mouth because I was going to buy an iPhone 5 because i had the 4S at the time. Seems familiar with what Samsung does, in similar ways. Also, desperate? When Samsung had (and still is) having that promo "$300 worth of accessories or cash when you buy a S6 or Note 5 blablabla", it wasnt "desperate" LOL. Now everyone is in here crying the opposite. Oh the funny joke of a community this website is. Shh. No tears. Only dreams now. Not to mention G4 with its free sd card and extra battery. Co worker always telling me how much better his phone is because of that. 2 battery swaps a day. Tell him a battery charge every other day. Now his screen dims when it gets hot. Samsung owners don't get spammed with advertisements for their latest phones when updating their apps on older phones. It was already announced that it was. Last year at this quarter they had sold 75M, while this year they only sold 51M. Do the math. This has already been announced. In fact 3 months after the 6S was released which showed promising sells for a few weeks, Apple was already announcing they were lowering production of the iPhone 6S models. http://www.zerohedge.com/news/2015-11-10/apple-cuts-component-orders-10-due-weak-iphone-6s-demand-credit-suisse This info was on PA, did you not see it? http://www.phonearena.com/news/Apple-said-to-reduce-component-orders-in-response-to-weak-iPhone-6s-sales_id74756 Also, remember Samsung pulled a move to release the Note 5 and S6 Edge+ before the iPhone 6S models appeared which also could have gotten potential iPhone buyers. On the first day the S6 Edge+ became available, I went to T-Mobile to try to get 3, but they didnt have (2) 64GB available. There was about 10 people in the store. I think only 2 walked out with an iPhone, only because they were tired of trying to get the S6 Edge+. So no, based on facts and numbers already stated in several articles, Apple didnt sell as many phones this time as this time less year to the tune of roughly 25M less. This is kinda sad to see 6s not getting the sales numbers. I think it's much better than the uninspiring iPhone 6 or 5s. iPhone 6 just brought a new bigger screen. There was nothing exciting about it, and it wasn't much better than the competition either. 6s on the other hand brings 3D Touch, a much needed camera resolution bump, a ridiculously powerful processor and destroys the competition in 2015( which isn't saying much since android OEMs aren't even trying). I think it's the first iPhone I can trade my phone with and not regret. Lol um no not even close to destroying the competition in 2015. 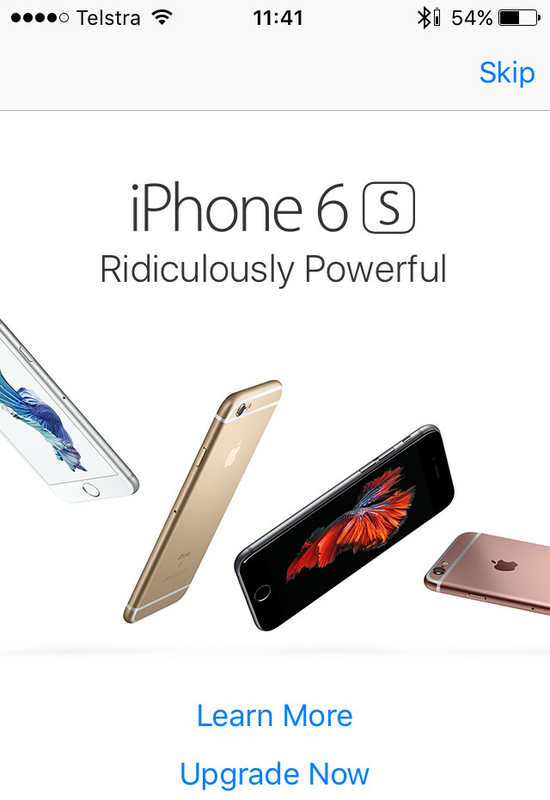 So which phone(not phablet) can compete with 6S? None right. Z5 and z5 compact have extremely poor SoC and an okay camera. Same goes for s6 as its SoC can't compare with A9. Also iPhone 6s lasts longer than both those phones. Not to forget proper slow-mo video 1080p@120 fps and 720p at 240 fps which neither s6 nor Z5 can do. And the 3D Touch, that SSD and other stuff just makes 6s superior. Lol puleeze. The Exynos can compete perfectly fine with the A9. In fact, it smokes the 6s in app opening speed with a much nicer display. Watch all the speed tests on YouTube. Don't forget the GS6 display is much nicer, uses a new design instead of an outdated 2014 iPhone 6 design, much better screen to body ratio, superior camera, wireless charging, OIS, a much nicer smart watch companion and that's just off the top of my head. It's also 6 months older and a much lower cost device and still smokes the s**t out of the 6s. Plus it has 32gb standard vs the 16gb. Let's just say Samsung decided to make the Note 5 a larger GS6 with an Spen for a reason, it's more than enough to smoke the s**t out of the 6s. QHD vs 750p, enough said. S6 has better display, better camera, fast charging, better multimedia, better audio, better signal reception (6s has worse reception than 4s), more features (touchwiz), stereo sound video recording, USB host support. Overall S6 is a better phone.